The phone rang. It was Mark. Just like the IMF, every time he calls, there is a secret squirrel assignment to be had. 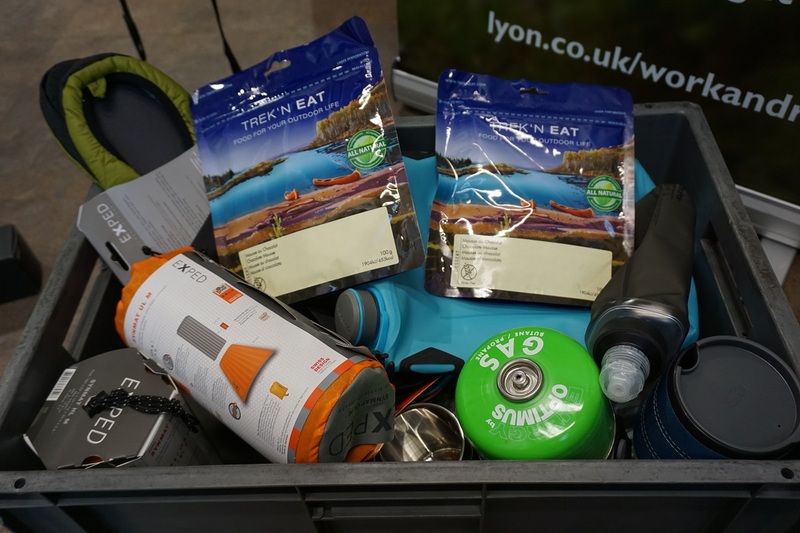 “Fancy visiting Lyon Equipment near Tebay to write a piece about them?” Knowing Lyon Equipment from back when I used to dabble in climbing and being a firm fan of the motorway services at Tebay (surely the best in the land bar none? ), I didn’t need to be asked twice. And so it was that I found myself rolling up outside Lyon’s impressively large factory and warehouse, Cumberland sausage roll in hand, on a dreich autumn day. My guides for the day were Chris Wright and Christine Findlay, two of Lyon’s finest while accompanying us was videographer Dave McFarlane who was going to film my visit. 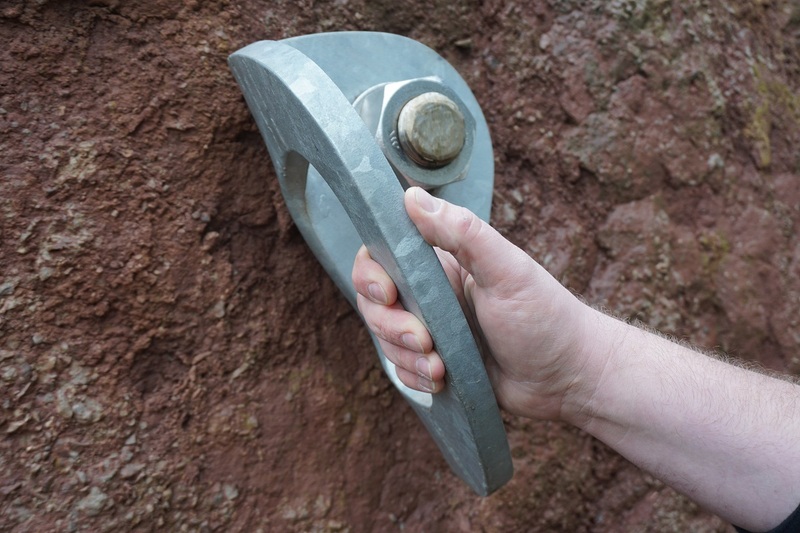 Tiny hands or a massive anchor bolt? You decide! Stepping into the reception, I was struck by just how deep the roots of the company are embedded in the outdoors. From the ceiling hung a Mountain Rescue Stretcher. As manufacturers of all the stretchers used by Scottish mountain rescue teams and being responsible for servicing all of the stretchers used by English and Welsh teams, the chances are that if you ever come a cropper out on the trail and have to call out the MRT, you may well be carried to safety on a stretcher that has come through Lyon HQ! Everywhere I looked, there was top notch kit. 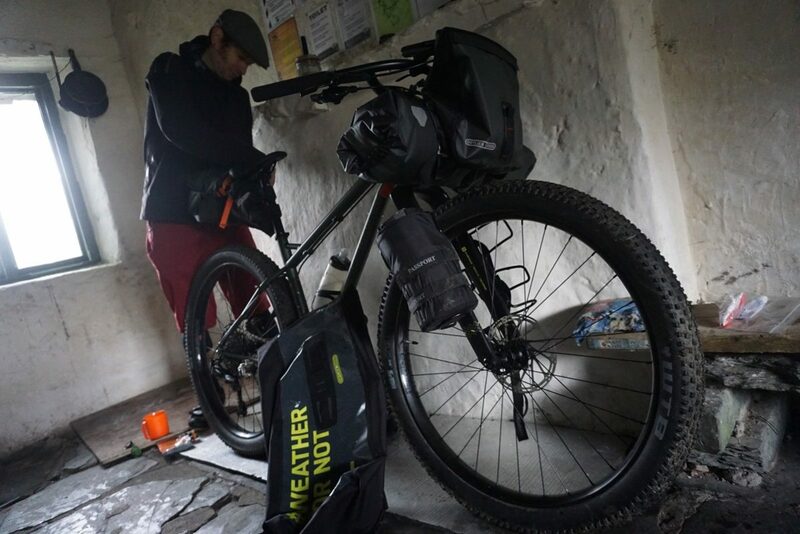 Bikes, panniers, racks, bikepacking bags, tents, boats, dry bags, cooking equipment, stoves, clothes, climbing gear, running shoes – it was Sport Billy’s idea of Gear Heaven. Starting way back in 1965 with their first product, caving ladders (Hmmm. Caving. Everything I hate – claustrophobia, suffocation, drowning, darkness, confined spaces, deadly gases and crushing all in one sport), they soon diversified into importing Petzl headtorches. From there, the company blossomed and now covers everything from working at height training through to manufacturing of rescue equipment and the supply of some seriously big name manufacturers products in sports ranging from cycling through caving to climbing and paddling. 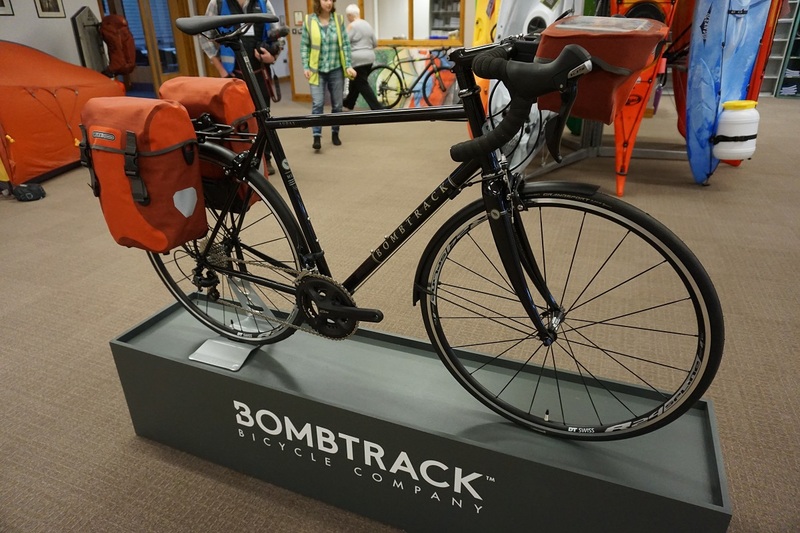 Well kent bike brands such as Bombtrack Bikes, Ortlieb, Tubus and Julbo complement their brands more familiar to climbers and walkers such as Exped, Optimus, La Sportiva, Petzl, Gregory Packs, Light my Fire and Trek and Eat to name but a few. It is in the world of cycling that Lyon have made great strides in growing their market share and presence in recent years. 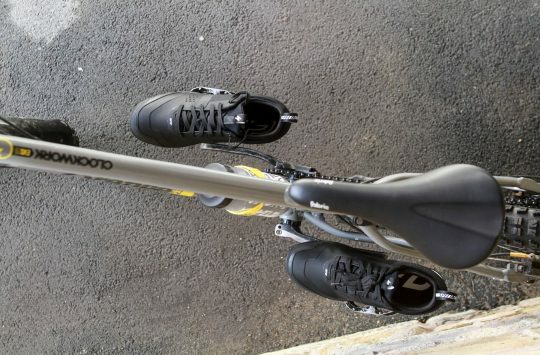 Adopting a program of large scale investment and taking on the likes Bombtrack Bikes as full distributor, Lyon are keen to continue to build on their success and become recognised as much for their cycling brands as their more familiar brands. They are the organisers of the Adventure Cycle Festival (www.adventurecyclefestival.co.uk) in the Lake District. Given the level of cross over between cycling and other outdoor pursuits, it is a logical move for Lyon. Bombtrack Audax ready for action rocking some classic Ortlieb panniers. Walking through the main showroom, I felt like a kid in a candy store. I didn’t know where to look. Packs were prodded, fleece fingered and switches, errrr, switched as my wish list of must have kit expanded exponentially. 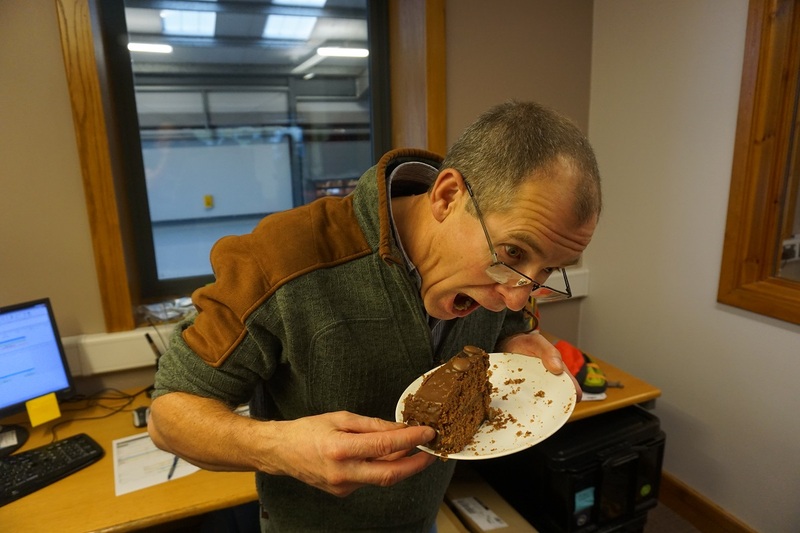 Stopping by the desk of Lyon’s answer to Q Branch, Roger, he showed us the remnants of what must have been an epic chocolate birthday cake. He didn’t share it mind! Q aka Roger…….still not sharing cake! Stepping into the warehouse, Dave and I immediately thought of the final scene in Raiders. Who works here, I wondered out loud. “Top Men” intoned Dave. “Top…..Men!” If the Ark of the Covenant ever needs a final resting place, this would be the place. Da de da Da da de daaaaa! Through another fingerprint recognition controlled door, we stepped into the training area. If you want to get certified for roped access work, this would be the place. With all manner of constructions including a grain silo and a basketball hoop, it’s safe to say they have all bases covered. Passing by a veritable mountain of stacked and ordered shoes, the smell of new trainers fills the air while a few more steps took us into the manufacturing heart of the operation. Looms of high tech cloth, computerised sewing machines, stacks of curiously shaped machined metal parts and other, for want of a better descriptor, stuff, fill every nook and cranny. Everything clearly has a place and there is a place for everything. Everyone I meet is chatty and enthusiastic in that unmistakeably Northern way. 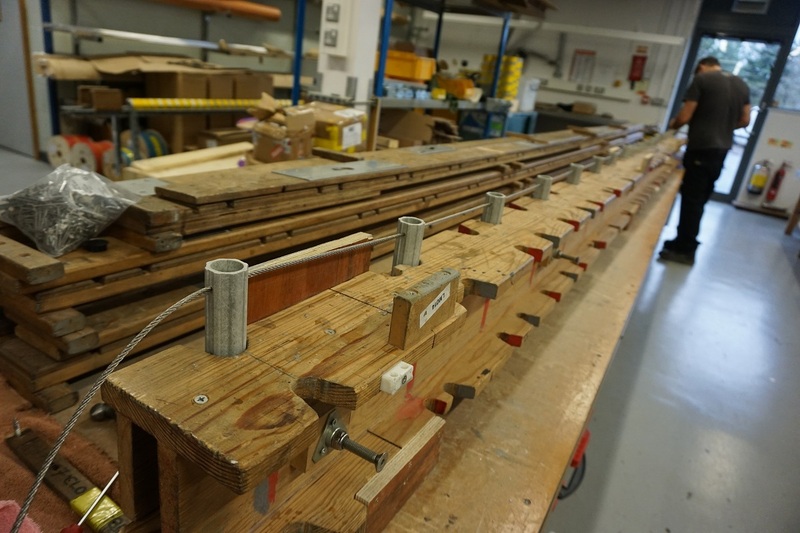 Caving ladders in the making. Out of the corner of my eye, I catch sight of the repairs area. Should kit you buy fail, Lyon offer a repair service. In this age of disposable consumerism, it is heartening to see but the piece de resistance is the steel water tray for locating punctures in dry bags and sleeping mats – handy for tyres too if the boss isn’t looking! “Lightbulb!” as Gru would say. 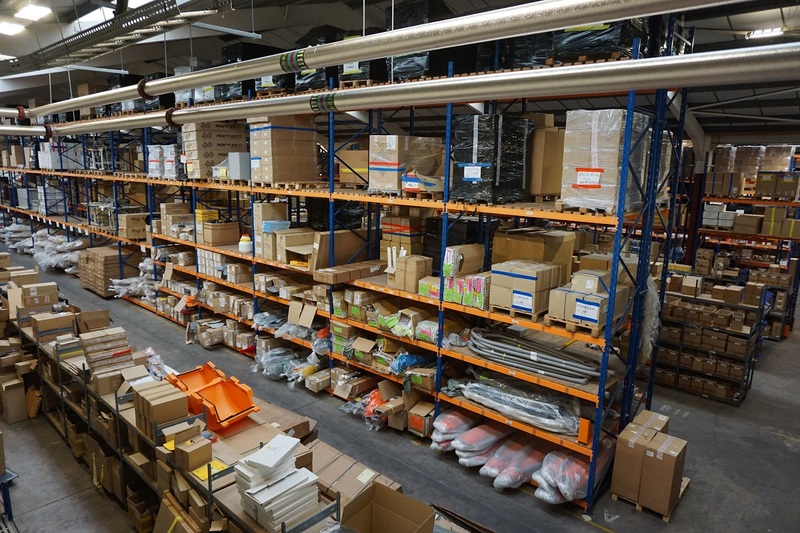 Looking through the myriad of kit in the warehouse and the showroom area, a thought occurred. 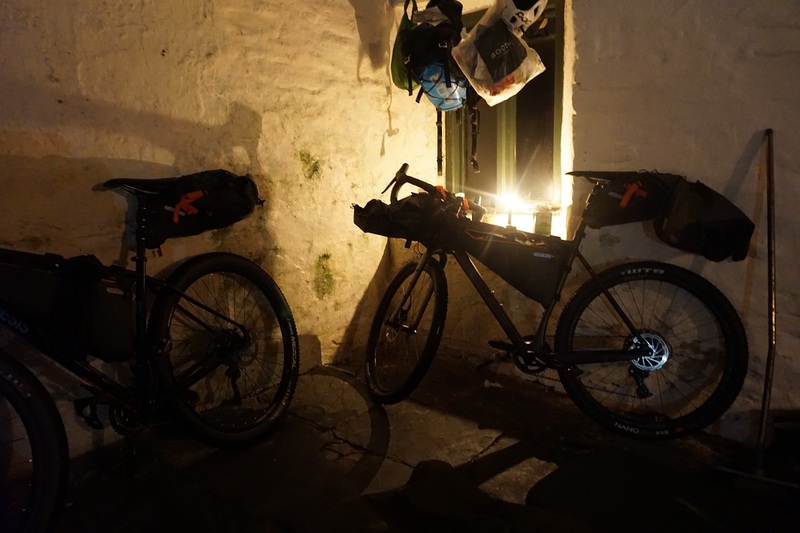 I looked somewhat conspiratorially around – bikepacking bags, sleeping bags and mats, cooking gear, headtorches, camp food, heck even bikes – we had pretty much everything we needed at our fingertips. Talking about gear is all well and good but it’s only by actually going out and using it in the field that you can really get a sense of how kit performs. What we needed to do was go on a Microadventure, Alastair Humphries style. As luck would have it, both Chris and Christine had blocked out the day for my visit while videographer Dave had a free pass. We were game on. Looking at the map and with an eye to the less than clement Autumnal Lakeland weather, we tossed around some ideas. Greg’s Hut on Cross Fell? Melmerby shop bothy? However, with Lyon Equipment being located within a stones’ throw of the Lakes, it would have been rude not to head west. 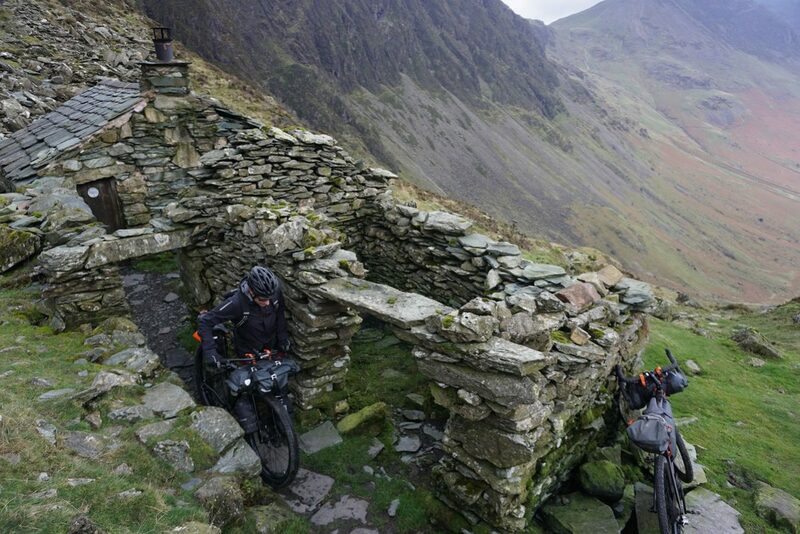 A quick scan of maps and we hit upon Dubs Hut at the head of Warnscale Pass. 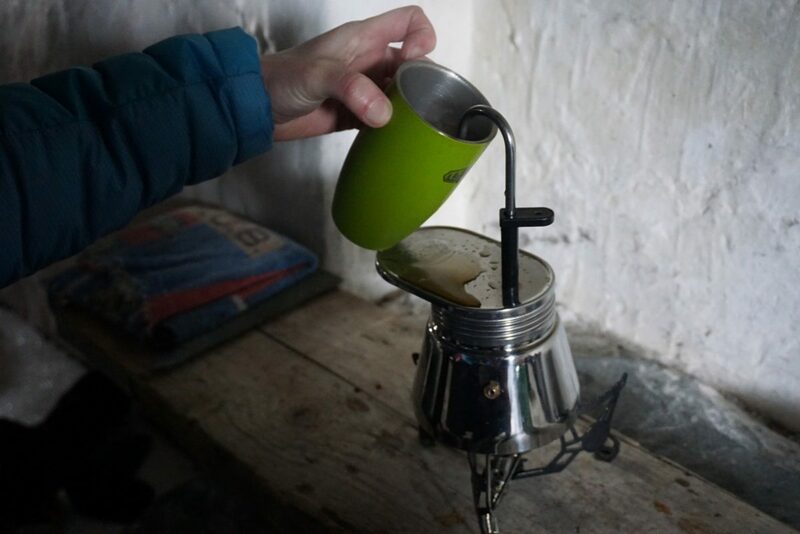 Having recently read about the renovation work that had just been completed by the Mountain Bothies Association, our assembled band took little persuasion. What would once have been described kindly as a dank and miserable hole has been transformed – the leaking roof that added character / misery (delete as appropriate), the damp riddled walls and the lack of a working fireplace have all been addressed. No more would you have to go outside on a freezing winter’s eve just to get a heat! Who knew there was so much kit you could buy associated with lighting a fire? Gathering handfuls of gear courtesy of Roger and his boxes of plenty, I rather felt like one of the kids on Crackerjack who made it through to the grand final. Instead of a Scalextric set, a cuddly toy and Kerplunk, our arms were overloaded with more gear than you could possibly shake a stick at…..which we couldn’t……as our arms were crammed to overflowing! Ask and we received. Bog roll holder dry bag? Check! Insanely bright headtorch. Yup! Mini stove espresso maker? Hell yeah! Who says you can’t have all your home luxuries? 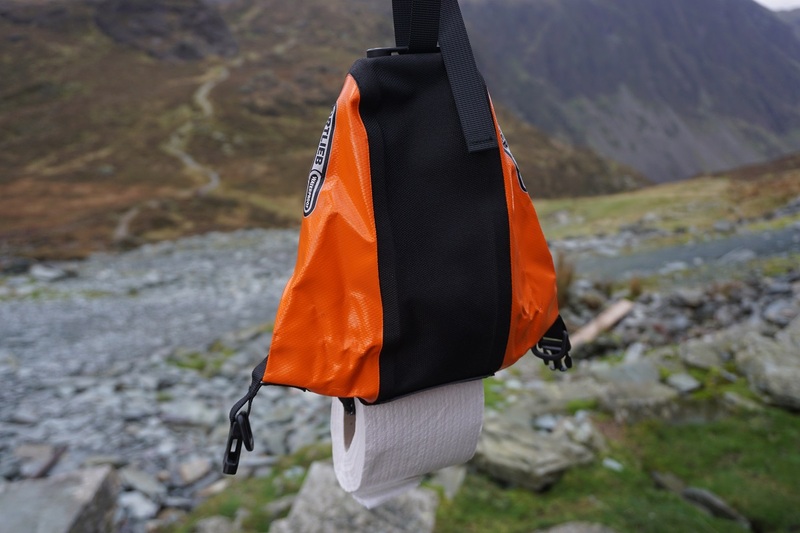 Ortlieb’s waterproof toilet roll bag. I rather imagine if I had asked for an artisan sleeping bag hewn from unicorn tears and dodo feathers by a pygmy tribe from upper Ulam-Battor, he would have produced one of those too. I swear Roger was one of The Borrowers in a former life. It still doesn’t make up for the cake he didn’t share with us though. Just saying. Pure unadultered luxury courtesy of the GSI Outdoors’ Glacier 1 cup mini espresso maker and Doppio stainless commuter mug. Who says a touch of class can’t be incorporated into your bikepacking microadventure? 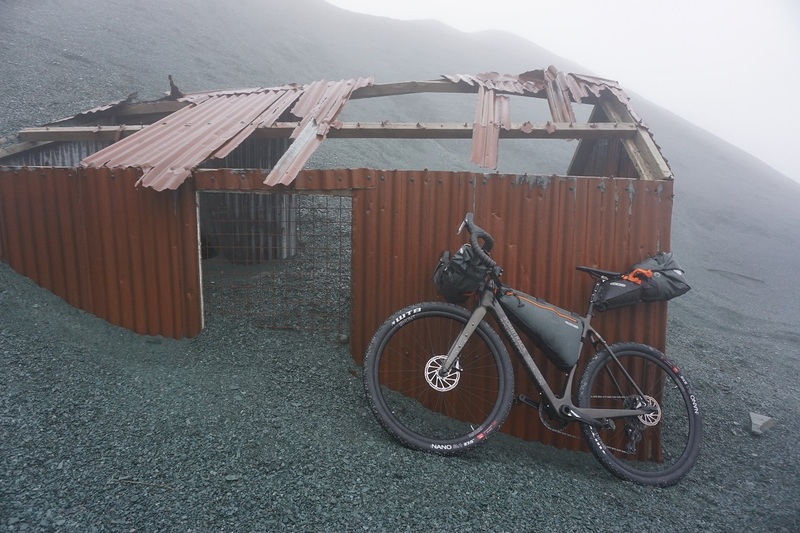 I’d like to say that we were like bikepacking ninjas as we filled our boots (and bags) with kit but we managed to take faffing to new levels of, errrr, faff. Should I take the down or synthetic mat? The ultralight, the superlight or the featherlight pillow? The chocolate or the amaretto mousse? Talk about first world problems. Chris believes in doing things in style. There is a lot of very fine Rioja in there! With my own gear, everything is a carefully curated selection honed over many trips. 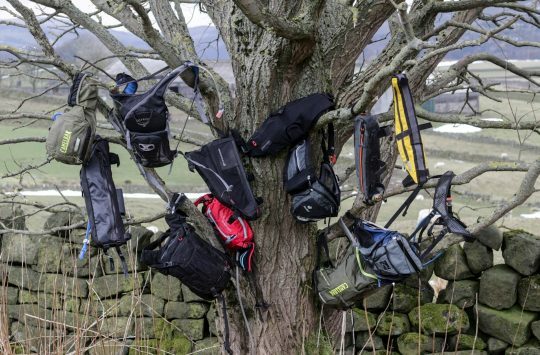 Pack and go – simples. However, with so much choice, I was in danger of getting weapons grade decision anxiety. 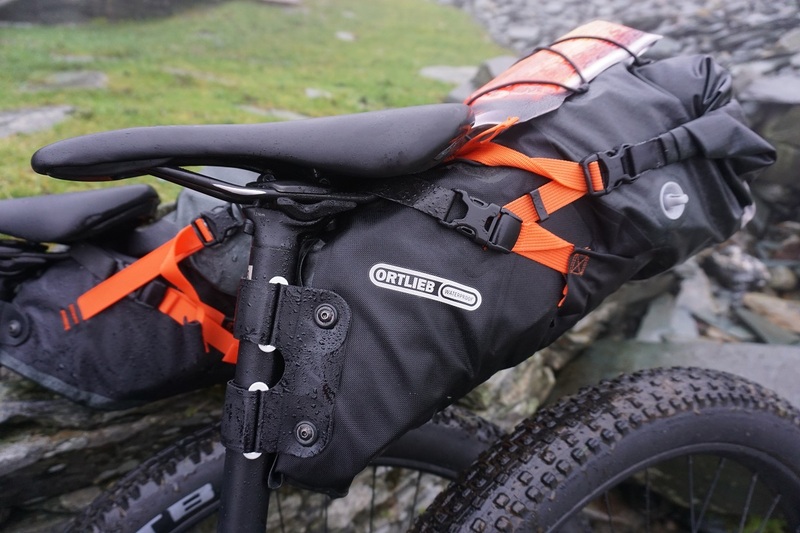 Ortlieb’s waterproof seat pack locked and loaded. Despite ourselves, we finally loaded up the van and headed for the bottom end of Derwent water where we even managed to arrive before dark. Well done us. As befits the wettest village in the UK (where else do you see flood measuring poles at the side of the road), the drizzle decided to join us. If nothing else, the Lake District is proof that that the Big Chap upstairs has a sense of humour – stunning scenery, not that you get to see it very often! Serioiusly, Chris! We’re only going away for one night! Showers, 5 or 6, clearing, poor. 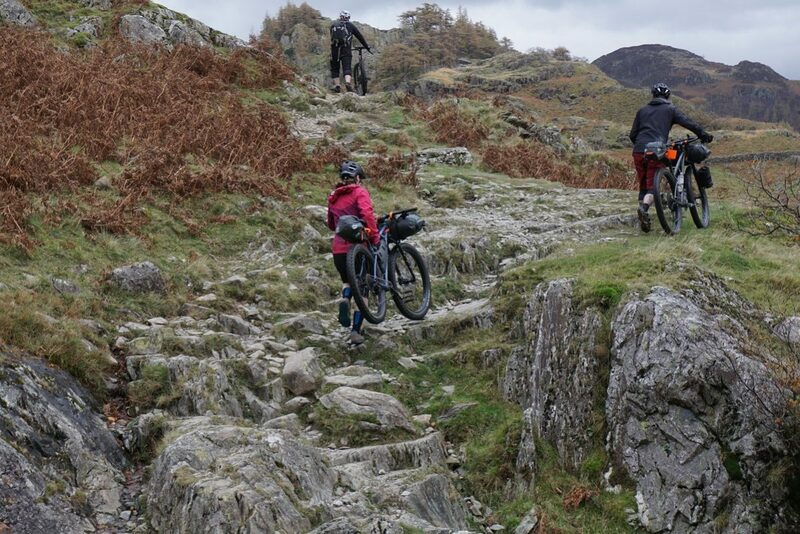 Heading up towards the double chevron road climb that is Honister Pass, we had all the cool niche bikepacking bases covered – 29 plus, 650B plus, gravel bike and drop bar 29er. 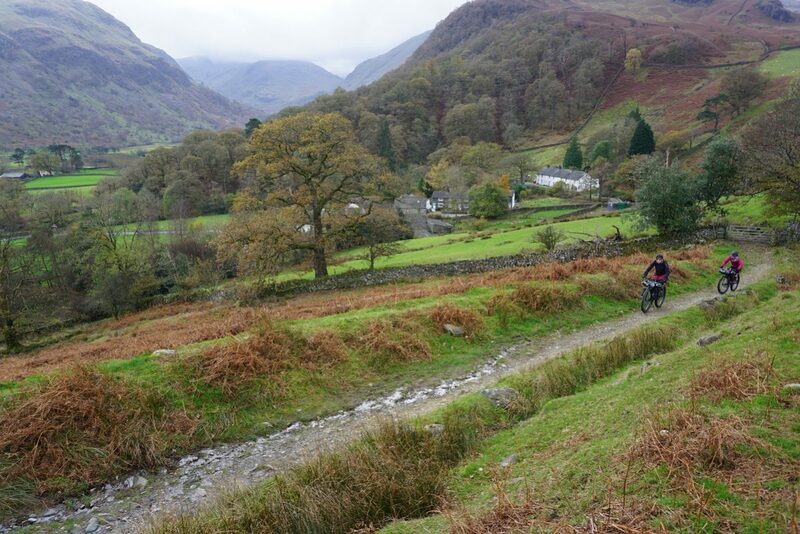 Having ridden the Borrowdale Bash many times, Dave was not looking forward to the unrelenting road climb. Fortunately, a perfectly positioned Bridleway exists that delivers a more civilised means of gaining height. 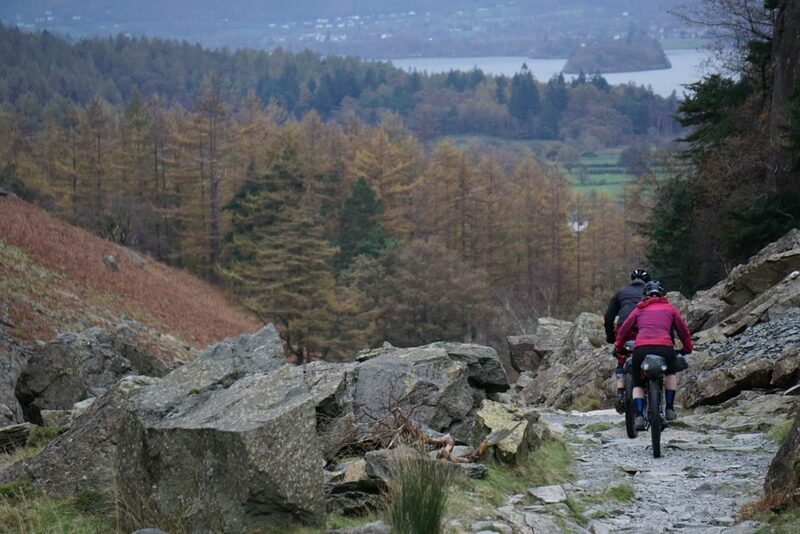 A cracking alternative to the road climb of despair. Starting gently on manicured Lakeland grassland, the trail climbs up before taking a dog leg where the smooth track is replaced with the local staple of loose stone and exposed bedrock. Line choice when fully loaded becomes critical. One misplaced wheel and it’s off and walking time. 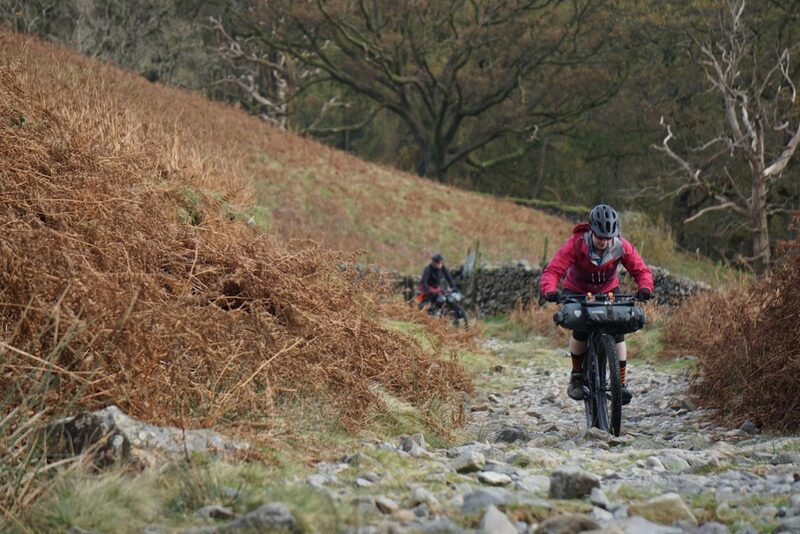 Despite my misgivings about the merits of one by drivetrains, I managed to find a line through the jumble of rocks and wheel spitting slate. Ahead, storm clouds were gathering; our chances of arriving dry at our bothy diminishing by the minute. No matter, the open fire would be all the sweeter. Ambling past Honister Slate Mine, the leaden skies lent a dark and foreboding air to our adventure. With a series of long abandoned mine entrances rising out of sight in a swirl of claustrophobic mist and murk, it was easy to imagine this as the inspiration for Tolkien’s Mines of Moria. Disinclined to find out first hand if there was a fiery whip toting Balrog in residence, we climbed up the ever steepening fire road. 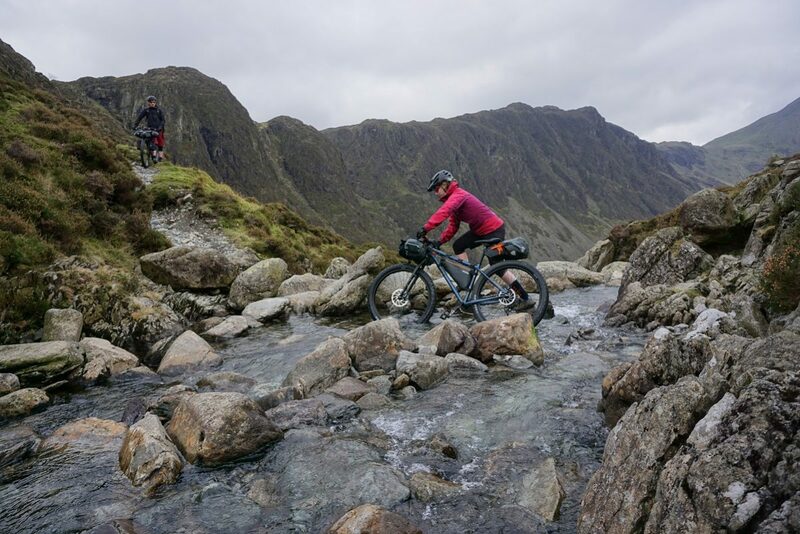 Fully loaded bikes, one by drivetrains and Lakeland climbs only ever have one outcome – engage the size nine gear. Chris’s Bombtrack Beyond + may have big fat tyres and Jones bars but with that amount of gear, gravity always wins! 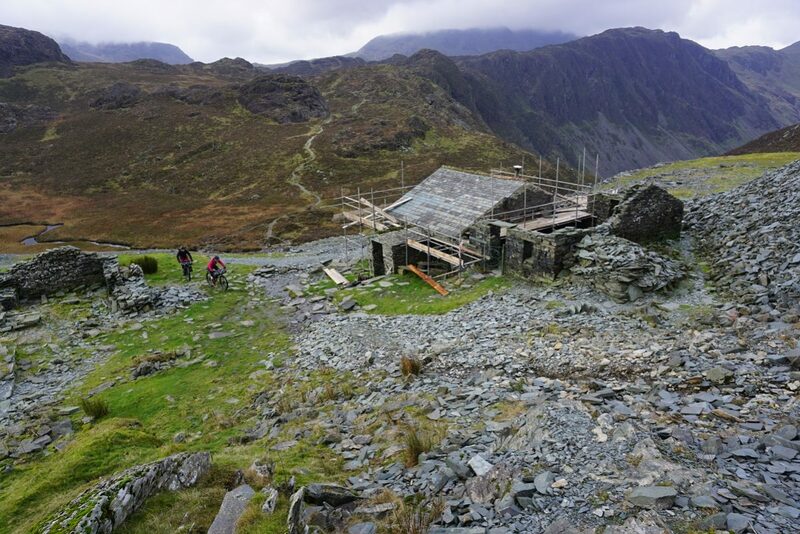 Cresting the summit, the many years of slate extraction have created a desolate landscape. To some, this might be the antithesis of what it means to be a National Park with World Heritage status but to me it speaks of a proud tradition of local industry. Bombtrack Hook EXT C resting against an old workies shed slowly succumbing to the ravages of time. 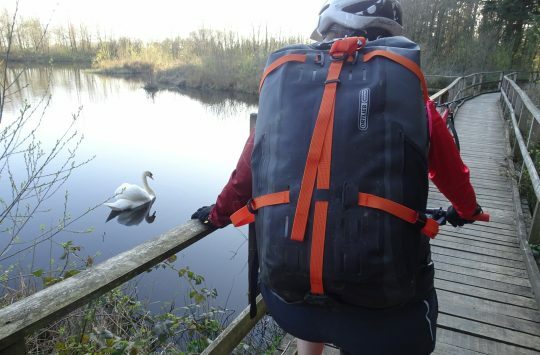 Frame bag, seat pack and handlebar bag from Ortlieb’s bikepacking range. The carefully manicured fells of the Lakes are the result of sheep farming. There is nothing natural or wild about it. To my mind, the slate mines are just as much a part of the fabric of the land and the people and should be embraced. The beauty is there – you just have to adjust your perspective a little. So dark the world turned black and white. With visibility reduced to yards, plans of extending the ride were abandoned. Instead, we made a break for our home for the night. It’s not often that I’ll end a ride mid-afternoon but there was gear to be oohed and aahed over. And a fire. Did I mention the fire? Like Hulk, me like fire! Still wearing the scaffold of recent renovations, walking through the door was like a breath of fresh air. The dingy air of old was long gone. 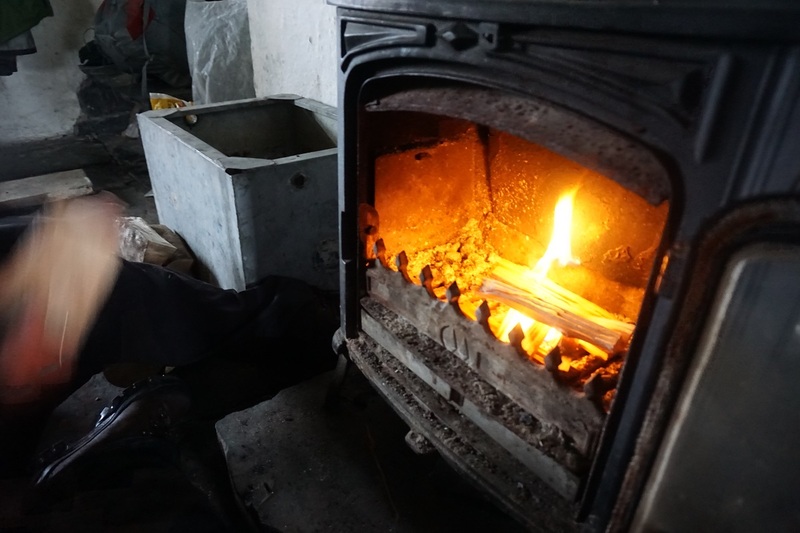 To our right, a wood burner – a true sight for sore eyes. With freshly painted walls, a table and chairs by the hearth and scaffold boards laid out as a temporary sleeping platform, just like Indy in The Last Crusade, we had chosen wisely. Adopting the time worn ritual of setting up for the evening ahead, mats were inflated, sleeping bags unfurled and stoves readied. 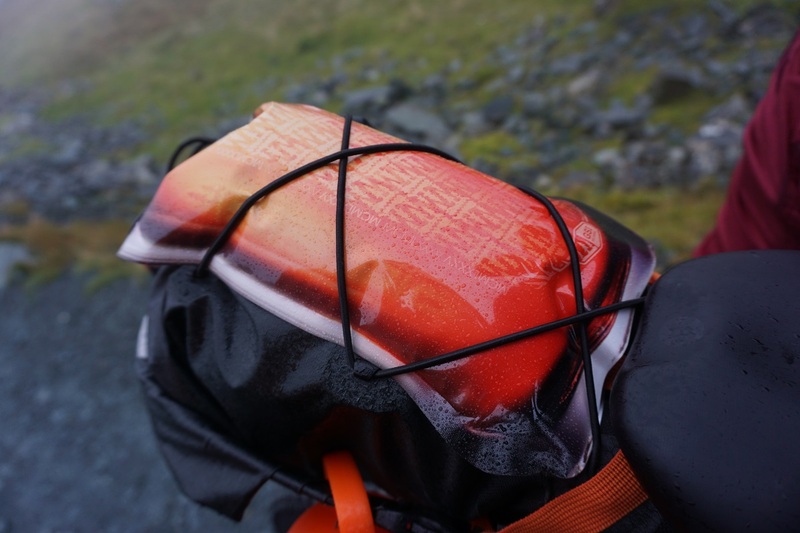 Inflating your mat the civilised way with the Exped Schnozzel Bag. As you would expect, making fire was our first task although it fell to fellow Bothy companion, Dave the gynaecologist (yup, that conversation about what he did for a job pretty much ended there!) did the needful. No tinder sticks and fire steels for him. Firelighters and a lighter were his tools of choice. He may not have been channelling his inner Ray Mears but he sure knew how to get a fire going quickly. Despite the early hour, discussion turned to dinner. Food was compared. Tipples of choice discussed. Dave and Chris went for the port and Famous Grouse option. I tried to hide my disgust. Grouse? I wouldn’t even clean the chain of my bike with that muck. No sir. Sanny doesn’t believe in roughing it when it comes to food. Nor sharing for that matter! As a true Scotsman, I eschewed the questionable delights of Scotch (as with haggis, Scotch is really just a joke played by us Scots on the world to see just how many folk we can fool into believing that it tastes and smells anything other than utterly foul) and opted for something more genteel and civilised: Archers Peach Schnapps with lemonade. Mmmmmmm! The Evolution of Exped Mat! Boom! Tisch! 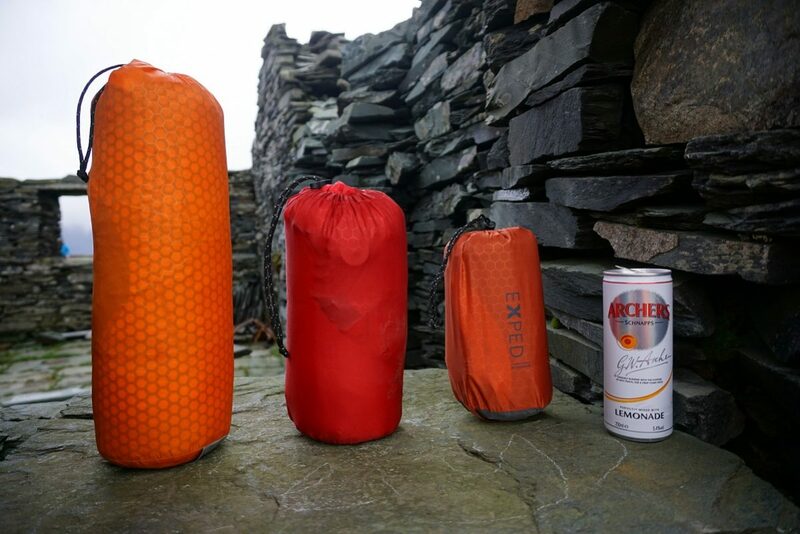 Left to right – Exped’s Synmat UL LW, Synmat HL Winter M and Synmat Hyperlite M sleeping mats. Peach Schnapps – Sanny’s own so paws off! As the evening wore on, the bothy filled with warm conversations of everything from past adventures to the appropriate order in which to watch Star Wars. Of course, anyone who has half a brain and a modicum of self-respect knows that the prequels are dreadful and should be avoided like the plague. The kip ship calls! 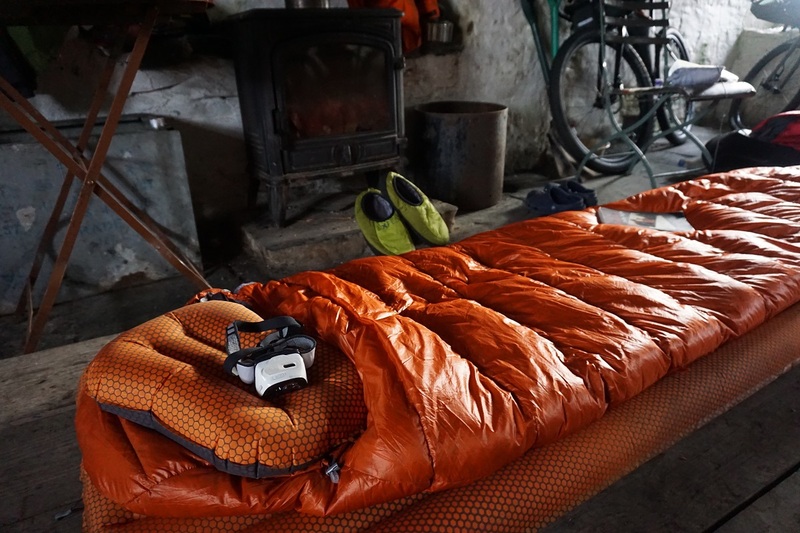 Exped’s Ultralite 300 sleeping bag, Synmat Hyperlite M sleeping mat, AirPillow UL, Bothy Slippers and Petzl Reactik headtorch. Fellow travellers came and went. 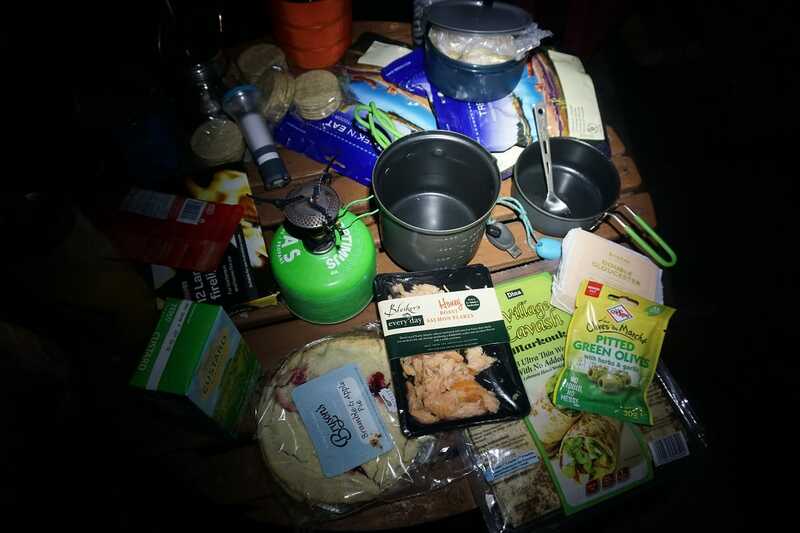 A father and son stopped for dinner while telling us of having just come from nearby Warnscale Bothy where they met a fellow traveller who was spending a few days there. Essential reading in the bothy. Being Halloween, had we had Pennywise masks with us, the temptation to go and trick or treat would have been hard to resist. Mind you, if I was staying alone in a bothy only to hear a scraping at the door accompanied by the strangled voice of Tim Curry saying “Hello Georgie!”,I’m not sure that I would have seen the funny side! 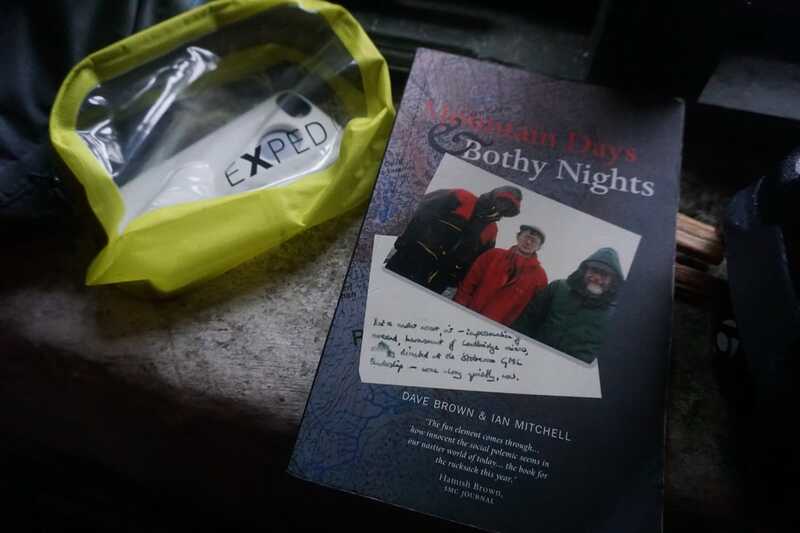 Best that we didn’t although it would have made for a great tale of how I got socked in the mouth in a bothy! With the fire dying down, we retired for the evening. With the wind howling and the rain lashing against the gable, it felt good to be warm and toastie in my sleeping bag. Sleep called. I answered and was soon on the kip ship to snoozetown. With morning came the inevitable rush for a wee. Why is it when you camp, you always wake up needing the toilet? Answers on a postcard please. Looking out through the condensation soaked windows, the overnight storm had blown through. Even the sun was making a valiant effort to appear. Breakfast practically inhaled, dishes cleaned, bags packed and bikes loaded, we headed down the tech fest that is Warnscale Pass. Hands that do dishes are as soft as your face……. 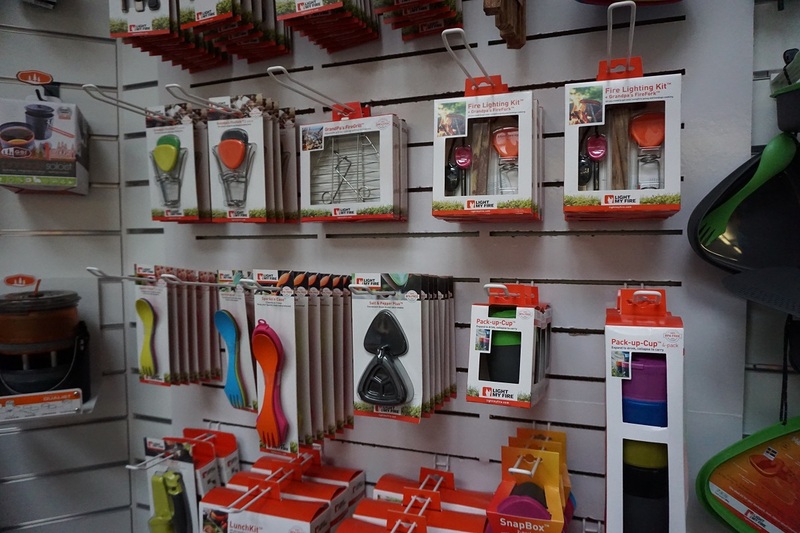 GSI Outdoors cookware, Optimus titanium spork, Optimus Weekend HE stove and Hydrapak water storage bag. This is easily one of my favourite trails in the Lakes but we would be leaving it for another day as we all wanted to visit Warnscale Bothy. With a bit of stream hopping and hikey bikey, it didn’t take long to reach it. Nestling in the bowl at the head of the valley, Warnscale has to rank as one of the best located huts anywhere, bar none. Short of a Colorado Fire Tower, I reckon you would be hard pushed to find its equal. It wouldn’t be a microadventure without wet feet. 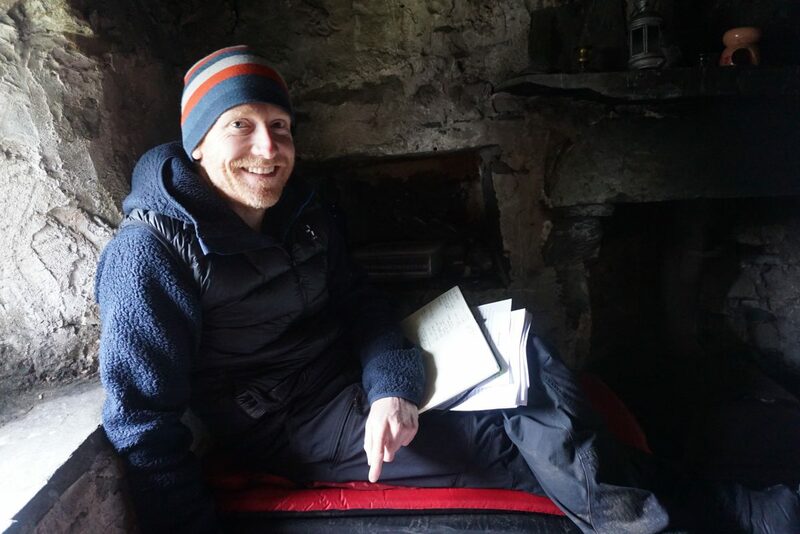 Opening the door, we were met by an affable chap who told us he had been staying in the bothy for a couple of days to work on a book he is writing and of the father and son who visited him the night before in the howling gale. “Do I know you from somewhere?” asked Chris. At this point, Dave chimed in. “It’s Al, isn’t it?” Thus it transpired that we were in the company of Mr Microadventure himself, Alastair Humphreys. 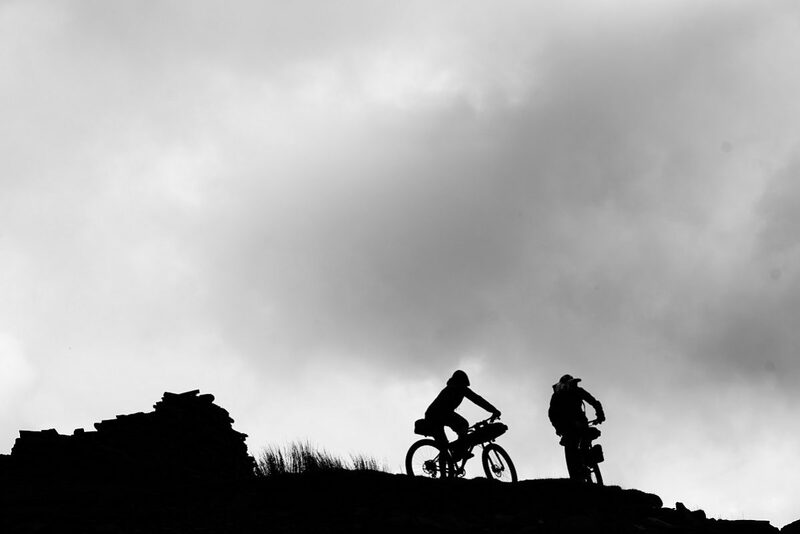 Al Humphreys – Mr Microadventure himself. I have to admit that the coincidence made me chuckle. “So what are you working on?” we asked. “Well the book As I Walked Out One Midsummer by Laurie Lee is one of my favourites so I decided to spend a month following his footsteps through Spain. Not a lot happened though.” Hmmmm. Methinks Al might want to work on his sales technique come publication! Having read his previous works, I suspect he may be underplaying it somewhat. His idea of not a lot is my idea of harrowing epic! Warnscale Bothy – definitely one for a return trip. 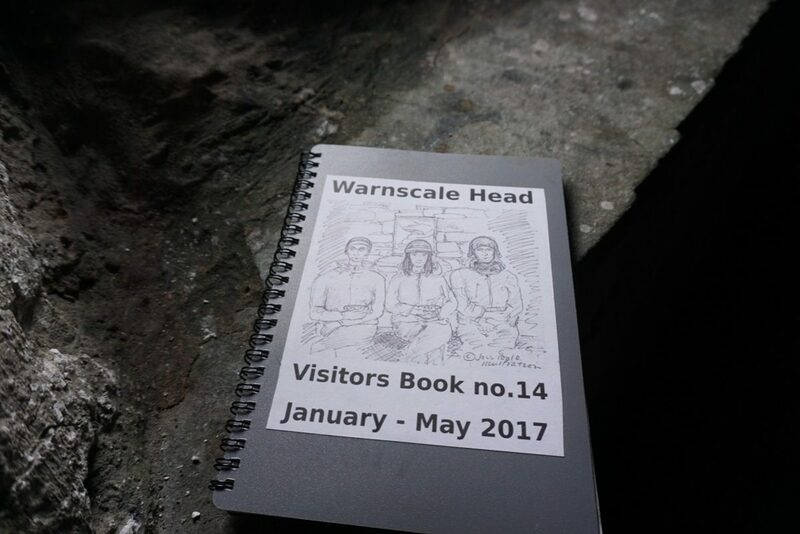 As with all bothys, Warnscale has a bothy book or, in this case, several. Al hunted through to find two pages that appealed to him. In it, we read of a young woman called Ana who had visited the bothy on her first anniversary with her boyfriend Matt. There was a couple of paragraphs from each which ended with “Life’s Good!” and a big smiley face. Turns out Ana was proposed to by Matt in the bothy and said yes. Nice work Matt! Quite simply one of the coolest bothy books I have ever read. Saying our farewells, we retraced our steps back over the pass before the plummet back down into the Derwent Valley far below. While we could have headed straight for the cars, the call of the trail down past Castle Crag was too great to resist. Stone pitching that would challenge even a full susser took on added spice on a gravel bike. Despite myself, I ended up in the valley floor unscathed while Dave sat with his wheel in his hand, the inevitable puncture coming to call. “These tyres are a nightmare. We’ll need tyre levers to get them off!” For Chris, this was a red rag to a bull as he proceeded to school Dave in the art of extracting a tubeless tyre from a rim using only his skills and cunning. With the sun slowly dropping behind the mountains, we spun back to base although not before a minor diversion to see the Bowder Stone. As boulders go, it is seriously impressive made all the more so by the two climbers we watched attempting some nasty problems under a vicious overhang. Not one for a newbie. Leaving them behind and with dusk settling, Chris and I spun back together and reflected upon what had been a truly excellent little adventure. I felt slightly bad for having shown Chris these Lakeland delights as I couldn’t help feel his home trails in the deep south would seem just that little bit poorer in future. No matter. We had had a cracking Microadventure and agreed that we would be back for more. This article is brought to you in association with Lyon Equipment.